Cruise through terrains with the Swagboard NG-1, whose PU wheels go over grass, concrete, sand and gravel! The board is said to be the cheapest one in the market, that provides excellent grip, strength and balance! It is best for people who are looking out for a good budget electric board, which upholds safety standards too! This board is more suited for teenagers and kids, as it gives a long range under a maximum weight of 176 pounds. It has been explicitly machinated to assimilate utmost safety, even pertaining to children above the age of 7! It has got a very unique shape; wide in the center and broad at the front and back, for better functionality and support. How Safe is Swagtron’s Swagboard NG-1? Is the NG-1 worth the price? The Swagtron Swagboard NG-1 lives up to its name in terms of its looks. The deck is 32 x 9” in area, and about 4 inches off the ground. Premium adherent grip tape extends across the stylish deck. This deck, which is strong and sturdy owing to its seven-layer ply Maple Wood, has a rigid truck attached for smoother balance. At the bottom lies the sentry shield battery encasing which is UL 2272 certified, meaning that on malfunction of the battery, no harm will come to the board or the user. Adding to that, it is also stain proof and water resistant. The board comes with a rather cushy remote which is oh-so convenient to use! With two handles on either side, it is suited also for kids who need help holding it with another partner! This design also allows the rider the comfort of holding it in two ways- one, like a bag, and the other- against the hip with your arm across the width of the deck. The NG-1 comes with quite good power considering the amount it sells for. It is packed with a 24-volt lithium ion battery (LPF standard), and it takes 1 and a half hours to charge. When it is fully recharged, this battery will give you about 8-10 miles in range, depending on the user’s weight, ride speed and other inhibitions. The Swagboard can go up to a speed of 17.8 kmph, which is quite the speed for a board driven by one motor, which is about 300 W hour! The remote controller is wireless, and has exemplary connectivity with the board. It displays the time, current speed, and battery. Moreover, there is an option of cruise control where you can ride at a stable speed. You can also reverse, using the remote, which serves as a braking mechanism. Overall the Swagboard gives the best range and speed amongst its competitors, and has safe batteries which on malfunctioning can be replaced free of cost! Certified with UL 2272 safety procedures, you can be confident in buying this board, without worries of getting electrocuted! The company also offers free replacements and returns. The entire board is U shaped and has premium grip tape for balance and to avoid sudden fall outs. The battery encasing is patented sentry shield multilayer casing, to prevent mishaps on battery failure. The batteries are Li-On Fe ones, which are industrially proven to be long lasting and give the best power. It also has a complete warranty for 1 year, in case of any manufacturing defect. Lastly, the board is designed such that it prevents falling even while going over rough edges, or on hills. The board comes ate just $199, is stuffed with world class batteries, gives the best range and speed in the market for its price, so of course, you shouldn’t miss out on the NG-1! The entire package comes with a user guide, a fully assembled board with re-adjustable truck, the remote, the charger for the remote and the batteries, a safety certificate and warranty card. 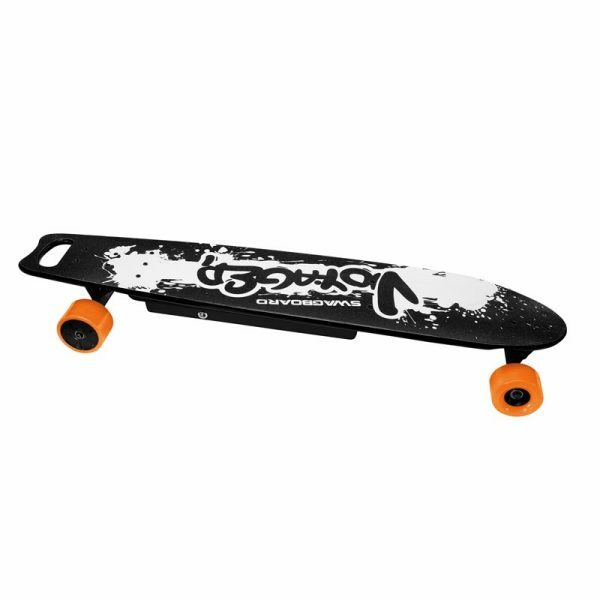 Swagboard NG-1 is the perfect choice for people on a budget, looking to get around places, and those who like to ride in style!